A soft and breathable crew neck base layer for extended exercise in cold and fair conditions. The Craft Active range combines air channeled polyester and filament yarns to create the ideal microclimate for cool weather endurance work-outs. When developing their base layer collection Craft always start out by determining in what temperature and at what intensity the garments should be used. The specific temperature range and intensity level then combine to form the basis for the continuing design and development process. 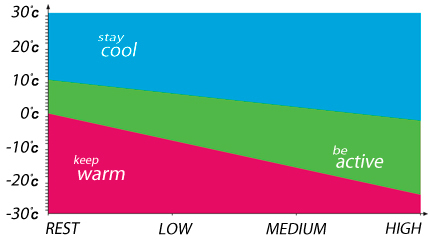 As a result, Craft offer the categories with unique performance characteristics that together cover all kinds of climates and intensities. For optimal performance and comfort, Craft’s base layer should always be worn underneath your outer layers, regardless of weather conditions. ACTIVE is Craft’s time-tested and classical underwear fabric. It is made of air-channelled polyester that expels excess heat away from the body while filament yarns transport the moisture, creating an optimal microclimate for endurance in fair and cold conditions. The channel-stitched polyester features two kinds of fibres for fantastic moisture transport and a soft touch. ACTIVE is arguably a living legend among functional underwear and one of the most trusted base layers for optimal performance. Is it the "old" model with extra long tail or the current "normal" (just a bit longer tail? The one I received does NOT have the extra long tail. It is just slightly longer at the back. Additional information about Buzzword could not be loaded. Additional information about Newboyracer could not be loaded. This has the standard length tail. Help. I have a 43" chest but I'm a short hobbit at 5'7". I have no idea what size to get. If I go with the guide it sounds as if this top will fit my chest but will drown my arms. What do you reckon? Additional information about Bobofrett could not be loaded. In my opinion the sleeves on this top are on the long side - I am 6'2'' and the sleeves are long for me, so maybe this top isn't the right shape for you. The material is quite stretchy though. Maybe try two sizes and send one back. Additional information about Leeeeeeeeeee could not be loaded. I think you may struggle to get an optimum fit with this, however it may be best to try a Large to start with and see how you get on. Additional information about WigglePaul could not be loaded.